Spiky obsession: Look what I've got. 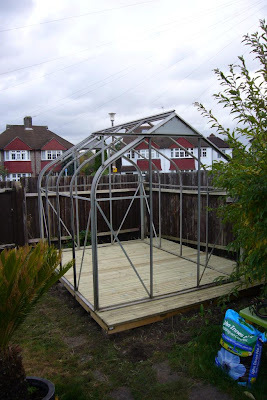 Having visited my friends house to see his new greenhouse last weekend, he commented that he was going to be taking down his old one and storing it for a year. So did I want it? Not being rude, but I wasn't too keen at first; I would have to find and clear someone for it, sort a base, and the greenhouse itself was bashed about, with several twisted struts. It is also cobbled together, as he was given the frame and cut some polycarb sheeting to fit. Then having thought about it, I decided it was too good to turn down. I could find somewhere for it, and it would give me a chance to test the size and also start on some shelving for when I get my full sized one. So today I invited my nephew over to play with some power tools and he jumped at the chance. Although I was given strict instructions by his parents to bring him back with all his fingers still attached. First we cleared part of the flower bed on the road side as this was the least likely to be used for any building stuff next year. In no time at all we had the base knocked up as a 2.4x3m deck. I know stone or concrete is better, but I wanted something I could re-use and wood was the only thing I know for sure I can use (even if not as a deck). This should be a good location in that it will get sun on everything above the fence all day, so will heat up quickly. I doubt I would use the same spot for the final greenhouse as you can see we are quite overlooked from that side, so I will most likely want to plant some taller plants in that bed to give us some privacy, shading that side of the garden. But for this year it will be fine. The greenhouse went up in no time at all, it actually took longer to clean and dis-infect than it did to do everything else. I was going to wait until it was complete and filled before posting pictures, but I couldn't wait. Hopefully I will get time to finish it off tomorrow, I have washed most of the polycarb and just need to tape the ends and fit them. So it looks like all my plants will be spoilt this year, but don't worry I am sure it will be back to the rough treatment again next year. I can't have them going soft on me. One of the main reasons for moving was to have a garden big enough for a greenhouse. It also means I will be able to actual garden and not just keep everything in pots. Who knows I may even fit in some non spiky plants! Very exciting! I'm happy for you but, like Scott, am a little jealous. Continuing down that slippery slope... =0) Happy for you, very!